The son of a prominent physician and politician (who served as Mayor of Oakland, State Senator and State Assemblyman), George Pardee was destined to follow in his father's footsteps. He was born in San Francisco in 1857 and raised in the family home in Oakland. Pardee attended the University of California where he received a Bachelor of Philosophy in 1879 and a Master of Arts in 1881. He attended the Cooper Medical College for two years and he received his Doctor of Medicine from the University of Leipzig, Germany in 1885. Pardee joined his father’s medical practice, which specialized in diseases of the eye and ear. 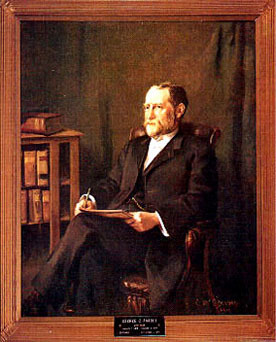 Pardee’s political career began when he was appointed to serve on Oakland’s Board of Health in 1889. In 1891, he was elected to Oakland’s City Council and in 1893 was elected Mayor for a two-year term. His exposure to innovative environmental conservation efforts in Germany heavily influenced his political decisions; as Governor, he was a strong supporter of conservation measures. After leaving office he was president of the East Bay Municipal Utilities district. The Pardee Dam, near Jackson, is named after him. Use the California State Library’s interactive tool to view Executive Orders and Proclamations signed by Governor Pardee.